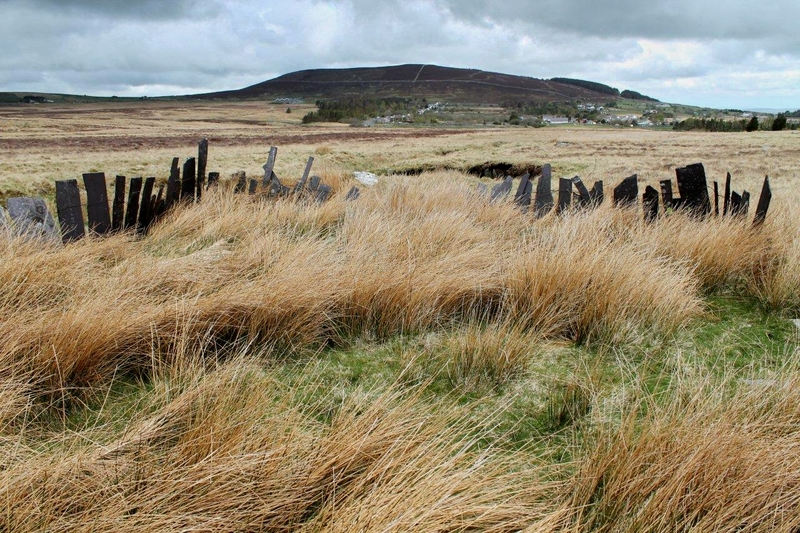 The sheepfolds are intriguing because they resemble prehistoric burial sites. 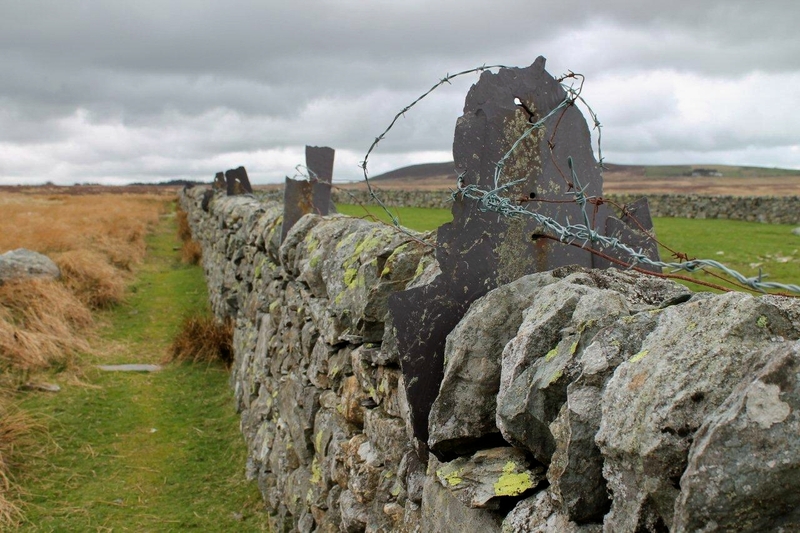 The walls – or fences – are fashioned from slender slate laths intertwined with wire. 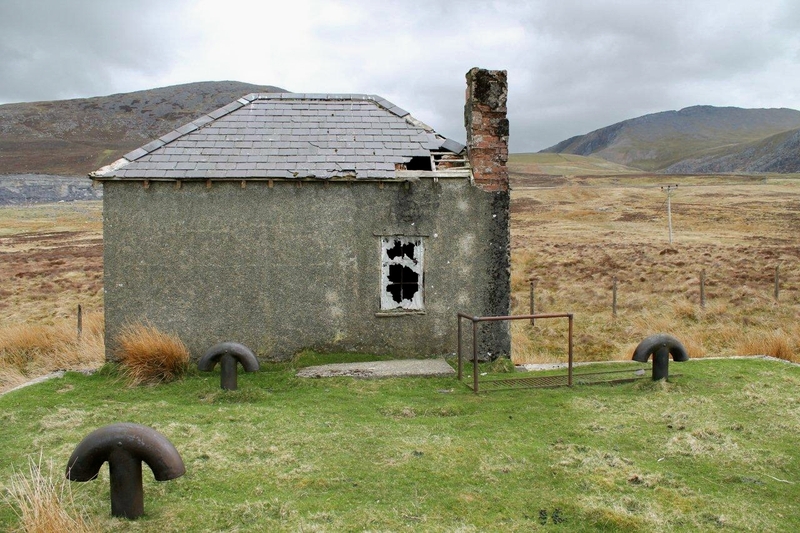 At the entrance to one is an old concrete structure that could be mistaken for a cist by people not unlike myself, though I suspect its true function is for dipping sheep. There again, taking into account the proximity of Bethesda, it could be something of far greater significance. JOHN 5: 1-3 After this there was a feast of the Jews, and Jesus went up to Jerusalem. Now there is in Jerusalem by the Sheep Gate a pool, which is called in Hebrew, Bethesda, having five porches. In these lay a great multitude of sick people, blind, lame, paralyzed, waiting for the moving of the water. This is John’s tale of the sick man who has lain by the pool of Bethesda for 38 years and is told by Jesus to take up his bed and walk, which he dutifully does. 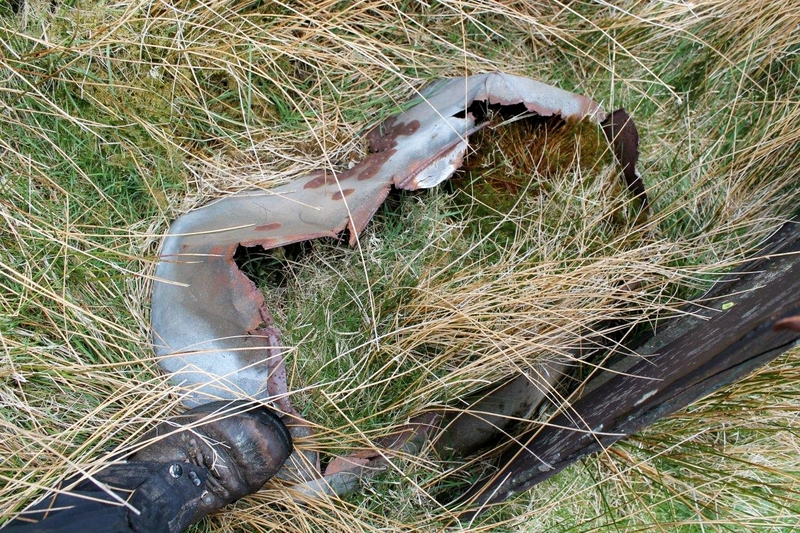 Next to my pool on the moor there’s an old tin bath rusting away in the rushes. John doesn’t allude to this. By the way, I have just discovered lamb oggies. Never heard of them? Lamb oggies are the Welsh equivalent of Cornish pasties and Scotch pies – short-crust pastry encasing minced lamb, leeks, potato, carrot, mint sauce and daffodils (just kidding on that last one). They are absolutely divine but probably very bad for your health. But so is work. The Glyders are standing in heavy rolling clouds and a terrific wind cuts through my four layers of clothing. 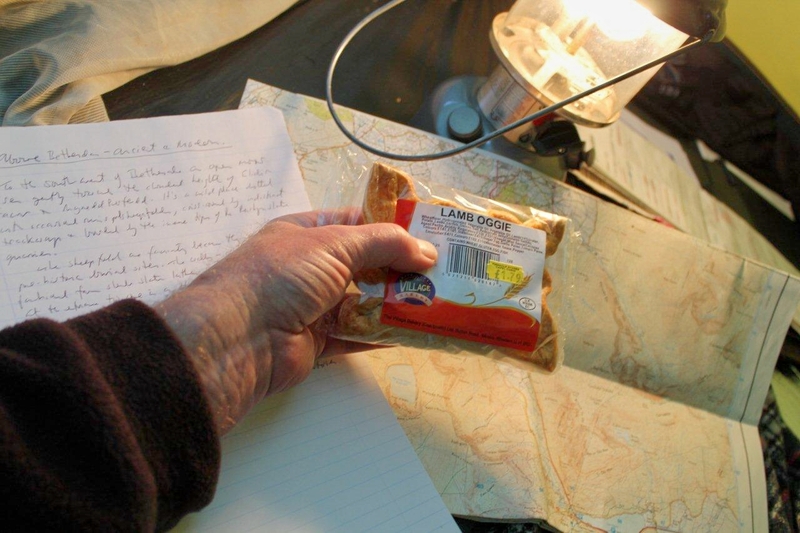 I’ve a swollen left knee which appeared to develop after yesterday’s incredibly steep descent off Pen yr Ole Wen – but it didn’t start swelling until after I’d eaten my first lamb oggie. Two lamb oggies later, my knee feels red hot and has increased in size. So because of the weather, and the swelling, and the fact I’ve got a long drive home tonight, I decide to give the summits a miss and save them for a better day. 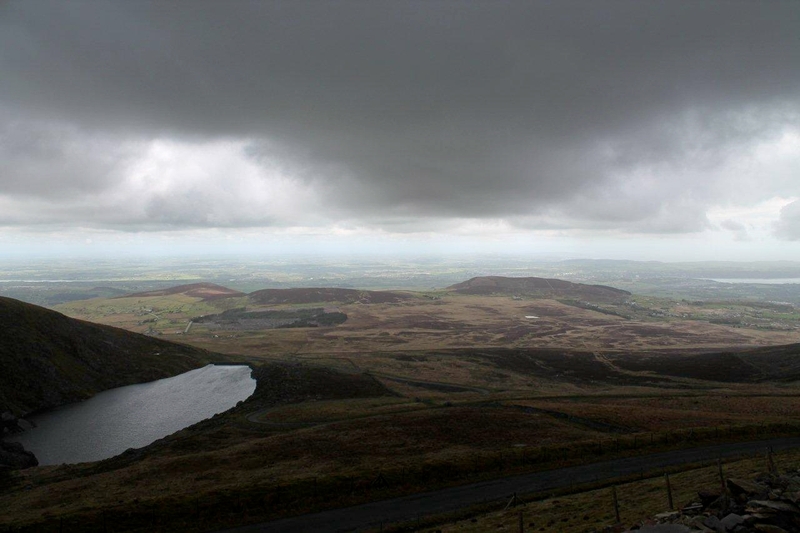 I hobble across this empty moor and climb to a reservoir called Marchlyn Mawr. I discover, somewhat annoyingly, there is a road all the way up to it from the southern side – but the road doesn’t appear on my map because it’s twenty years out of date and the reservoir was enlarged and modernised about four years ago. I gaze through the locked gates of two waterworks tunnels that disappear alluringly into the depths of the mountains. Strange and angry noises echo from within – probably caused by the distorted sounds of falling water echoing along concrete tunnels. But they might be caused by goblins. 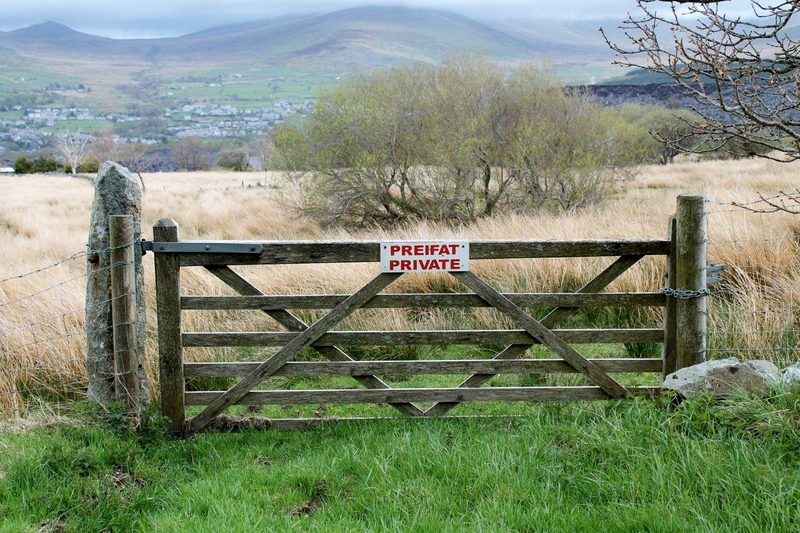 Either way, I want to push the gates open and go inside. If this makes me sound brave it’s because goblins aren’t real. On the way back to Bethesda I scale a couple of fences and an inconveniently placed bank of rubble to gaze down into the biggest slate quarry in the world – Penrhyn. My mother told me tales about Penrhyn. Most mothers are content to entertain their children with stuff like Hansel and Gretal or Little Red Riding Hood, but I was raised on the intricacies of the European slate industry because my mother worked in the business. It was a real treat to visit her office and marvel at the tape spilling out of the Telex machine. We appreciated proper entertainment in those days. What you see in the photographs is just the modern operation at Penrhyn – there is as much again beyond the hill. It’s an impressive place. If your house has purple slates on its roof, then this area is almost certainly where they came from. What do you mean, you don’t know what colour your roof is? For Christ’s sake, go and take a look. And if it’s slate, and if they’re purple, let me know. I was going to tell you about the Penrhyn Lock-Out of 1900 to 1903, when 2,800 men walked out on strike and embarked on what was to become the longest industrial dispute in British history. But I’m not in the mood today. My knee’s still hurting. 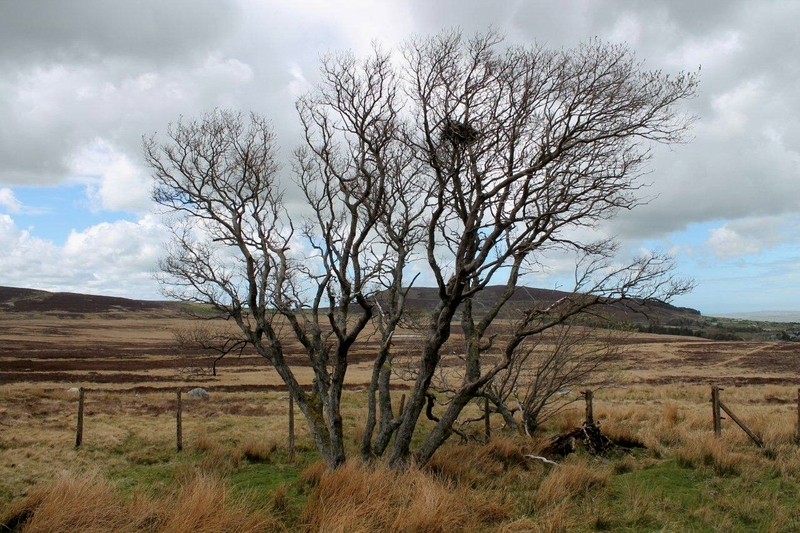 I hobble back across the moor and pass the sheepfold. In a flash of inspiration, I dip my knee in the Bethesda sheep bath in search of a miracle cure. The swelling subsides immediately and the pain eases. I don’t expect you to believe this. JOHN 5: 8-9 Jesus said to him, “Rise, take up your bed and walk.” And immediately the man was made well, took up his bed, and walked. So there you go. Miracle cure. Have you had a look at that roof yet? 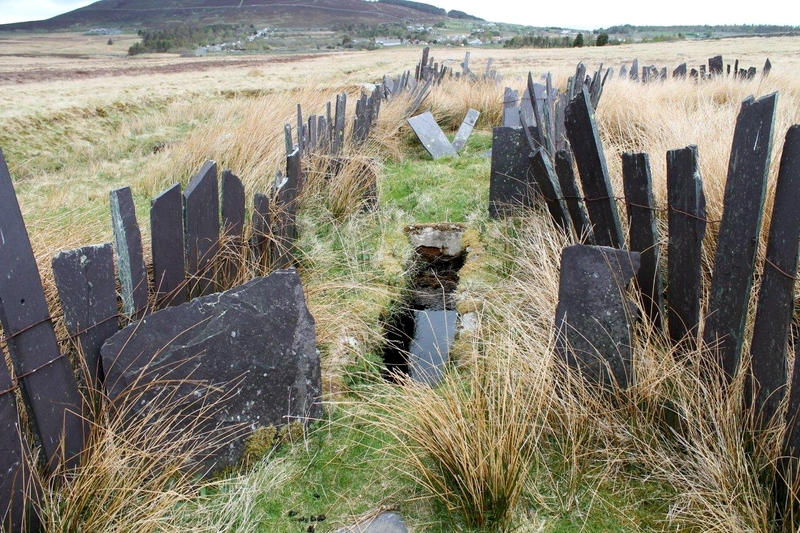 This entry was posted in Archaeology, Climbing, Environment, Food, Geology, Hiking, History, Industrial archaeology, Mountains, Quarrying, Religion, Scotch pies, Slate quarries, Walking and tagged Mining History, outdoors, Snowdonia, Wales. Bookmark the permalink. Andrew, I had never heard of them either until I strolled into a general store in Capel Curig. It was an awakening, maybe not quite of Biblical proportions but close to it. Well, if it was the lamb oggie that started the knee swelling, and the sheep bath that cured it then there’s a nice circularity to it. You’re absolutely correct, Scott. In fact, at one point I toyed with the notion of introducing the theory of homeopathy but it got a bit too complicated. The knee’s been fine ever since, mind. I am another one that has never heard of Lamb Oggies. 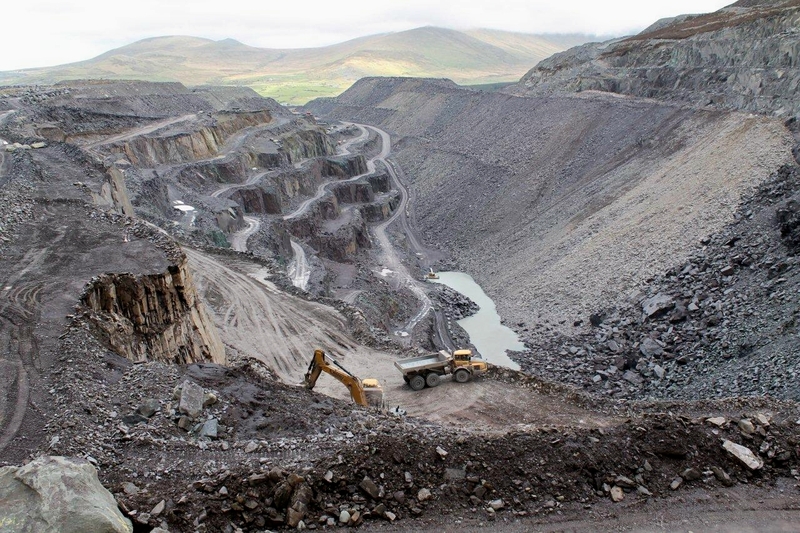 That slate quarry is seriously massive – not sure if my slates look purple of grey though. Next time one blows off I will take a closer look. Hi David. It’s a shame Greggs don’t do oggies. I think there’s an opening in Barny for some budding bakers. My slates are the same. Can’t tell either way – not from the ground anyway, and I’m sure I’m not going up just to check. Haha, Alen – great post but I really hope your knee is feeling better now! Are those ventilation pipes in the 3rd pic? We had purple slates on our roof in Penmachno, and purple chippings in the garden. I remember seeing fences made of those wired-up laths, and thinking it would surely have been easier to plant a hedge or even build a stone wall (which would last longer) but they do add a certain look and feel to the landscape. 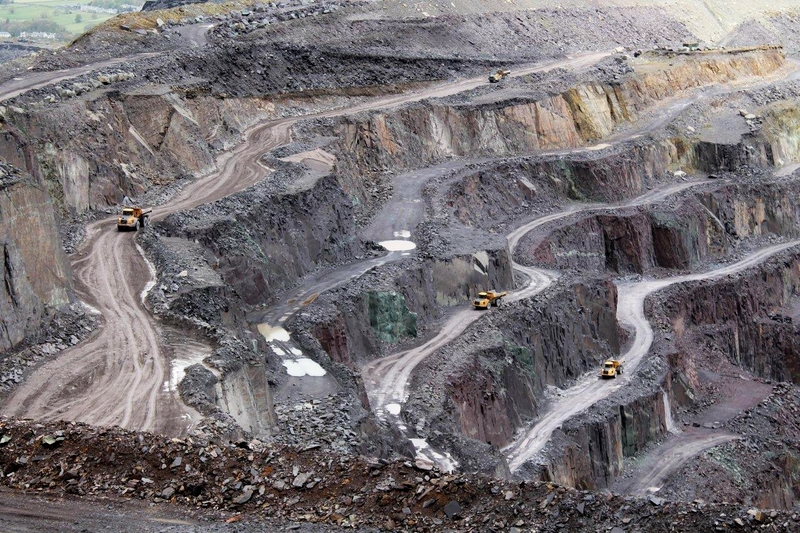 Bethesda quarry is spectacular – I have never seen pictures of the inside of it. Lamb oggies – if you are ever at a show such as the Royal Welsh or similar, they sell massive versions of these, enough to feed 6 people! 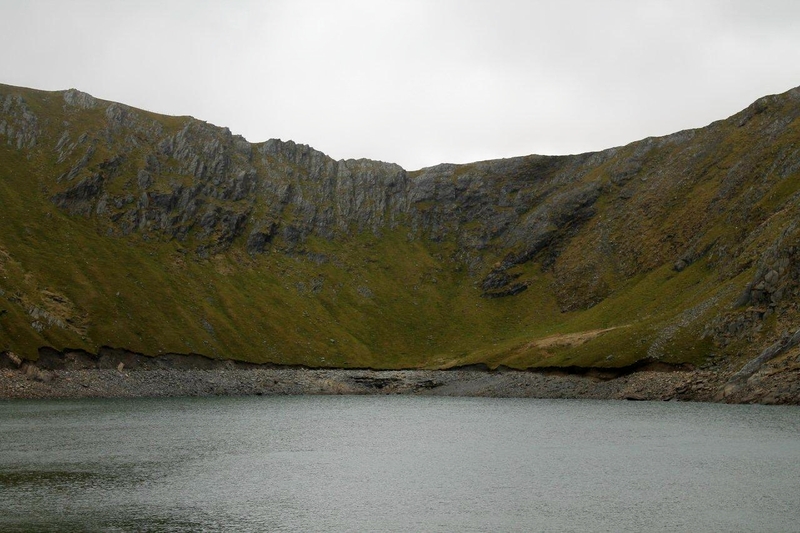 ‘Marchlyn’ means ‘lake of the knight’ by the way – I wonder if there is any significance? Wow, a wealth of information there, Jo. The pipes, I think, are something to do with an antiquated water system. There was a manhole leading down into a chamber that appeared to be full of rubbish and worse. I thought the same about the slate laths. If you possess fencing wire, why go to the trouble of carting all that slate up there when a few fence poles would do? Still, they do add to the charm of the place. Lamb oggies big enough to feed six people? Hold me back. I need to book a ticket for the Royal Welsh Show right now (I went to one in Builth Wells when I was a child, but I don’t recall eating oggies). The lake of the knight thing is interesting. I’ve just had a quick glance on Google and there’s a reference to it being a burial place of King Arthur. What I also learned, and didn’t realise, is that Marchlyn Mawr is the storage reservoir for the Dinorwic power plant. I’d heard about this years ago. 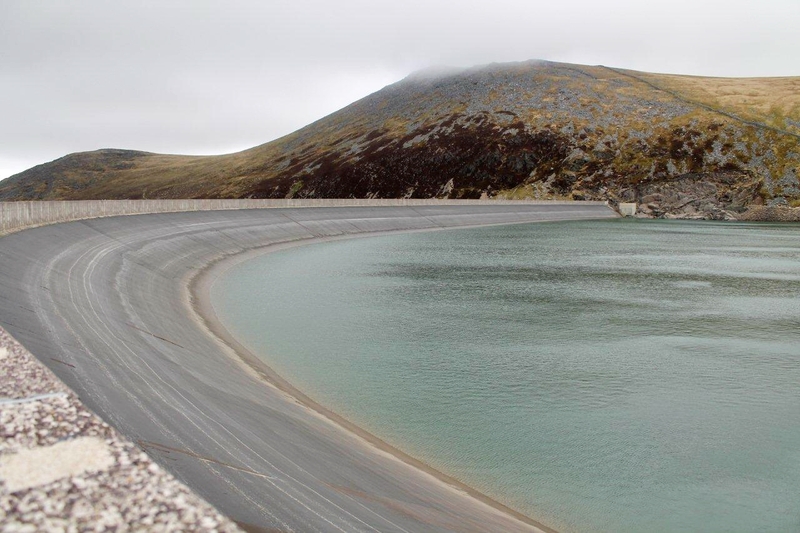 Water is pumped up to Marchlyn Mawr during the night when demand is low, then if a sudden surge is required by the National Grid during the daytime, the water is released through a tunnel to the generators down at Dinorwic. Perhaps Arthur was washed away years ago. 🙂 There’s obviously a lot that I didn’t know about Bethesda, and I used to drive through it every day! Thanks for the answers! A dry-stone wall definitely doesn’t last longer than those slate fences – they need rebuilding quite a bit, especially since our climate got so much wetter. Ours are needing a lot of work in the Dales recently with the weather being so bad lately. I think those fences are a great use of the local slate. Your story is entertaining, witty, and full of information as usual. The pictures are great and evocative. I can see that those views from high above are addictive and must make you want to get up there, knee or no. Like I’ve become addicted to your blog. Hi Magrid. Thanks for the fantastic comment – I needed something to cheer me up today. 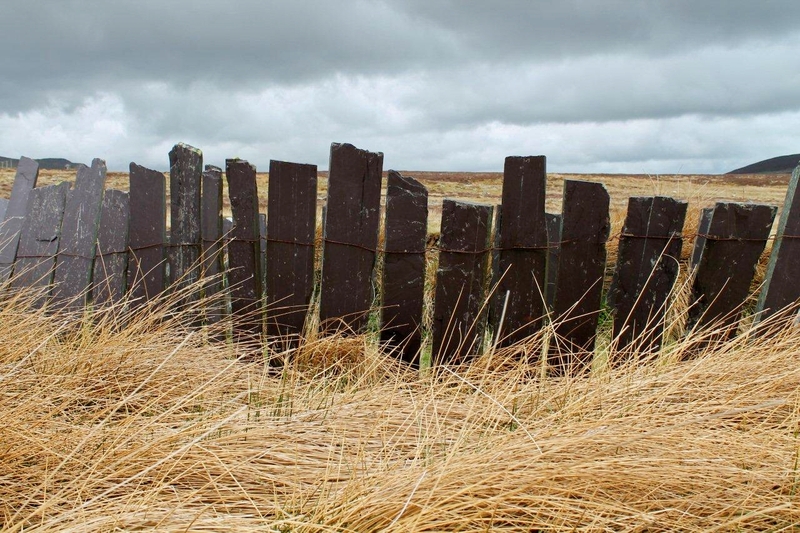 I love those slate-fences they make in Wales – there’s also one near Wycoller in West Yorkshire (Bronte moors). 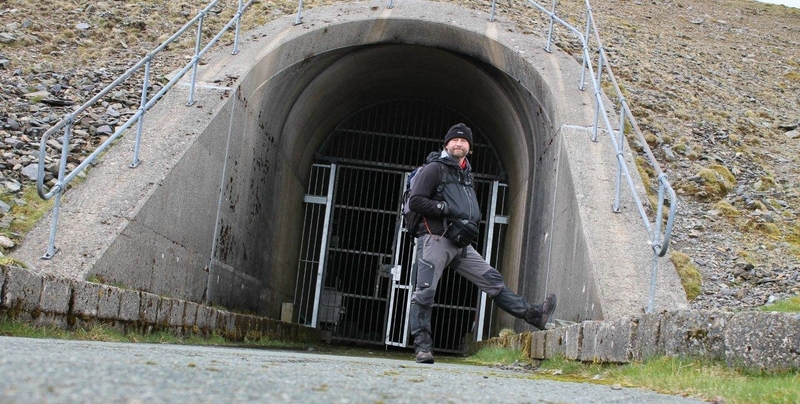 I am also totally fascinated by those water tunnels going into the mountains around Elidir Fawr and Marchlwyn Reservoir and would love to have a look through them. Hi Carol. You got me with Wycoller. I’ve never heard of that place so I had to carry out extensive research to locate it. Green slates are good. If they’re Cumbrian they’ll last for ever. Welsh green tend to be thinner and more genteel, but strong all the same. Yes, tunnels like that need to be explored. They should have a little chap at the gate charging people half a crown for a look around. I should send them an email with a few suggestions. 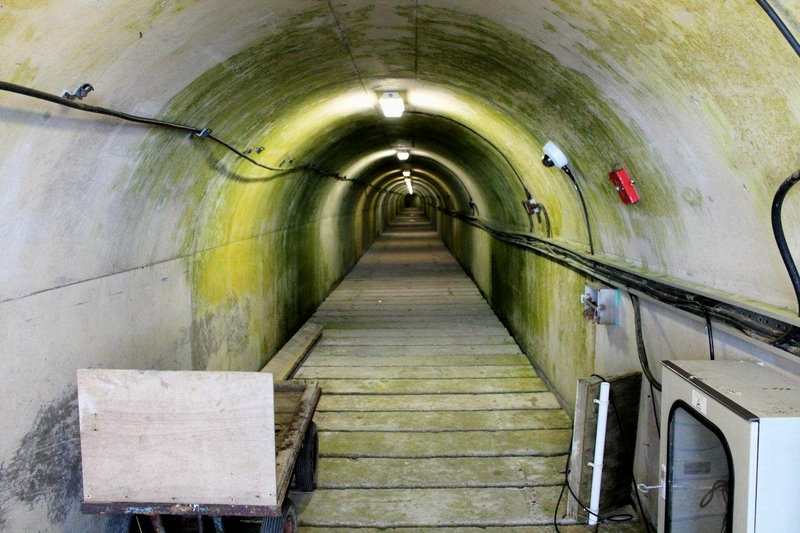 I’d certainly pay to have a nose around those tunnels! Penrhyn looks like an amazing place, very impressing. I came to think of L’Alpe d’Huez when I looked at your pictures, Alen. Hope your knee are much better with or without the miracle cure from the Betheda sheep bath. Hi Hanna. Sorry about the delay in replying to your comment but I’ve been climbing lush green mountains across the sea. I once toyed with the notion of cycling up l’Alpe d’Huez. Needless to say I never did it because it would probably have killed me. I did drive up it once in an old Vauxhall Astra though. Thank you for inquiring about my knee. It has been fine since Bethesda and has given me no problems on two recent hard days in the hills. Alen, I love your writing and photographs – not just here but in all your posts. This is what blogging was invented for. Thank you! Thanks for that Richard. It’s the kindest thing anyone has said to me for ages. I love blogging, and comments like yours make it all worthwhile. Hello Alen – Nice to see the hills again. I haven’t been down to Wales for yonks. My knees are pretty knackered nowadays, so perhaps I’ll hobble up there and have a sheep dip. I walked up the other side from Deiniolen Village to the waterboard track, up to Marchlyn Mawr reservoir, then traversed the hillside to Carnedd y-filiast. Along the ridge to Mynydd Perfedd, and walked the ridge of Bwlch y Marchlyn and up to Elidir Fawr. Along Bwlch Melynwyn and drop down to Elidir Fach, down the hillside to the reservoir and back to the village. All in deep snow – I could walk over the top of a 2m styal. That slate is so tactile, I reckon that’s why they all took the trouble to take it up there. Hi Pete. That sounds like a great walk. 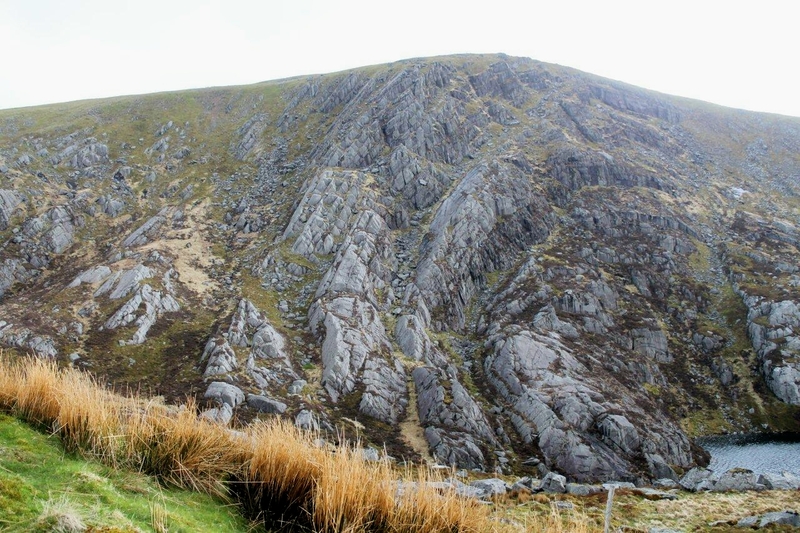 The ridge across to Elidir Fawr looks pretty spectacular from below. It was on my list of to-do walks but I ran out of time. Hopefully I’ll get chance to have a crack at it in the future – perhaps this back end. It sounds like a bit of a challenge in deep snow. Hope your knees hold up.